Though they were once good pals, Lester Jerome and Arnold Manning have drifted apart while in medical school, with Arnold heading down the respectable path of traditional medicine and Lester convinced that sickness dwells only in the patient's mind. With the beautiful Laurie coming between them, the men become antagonistic toward each other and fall out of touch. When Laurie develops a tumor, Dr. Manning tells Dr. Jerome he'll be operating but Jerome is convinced his way is the best way. Manning operates and Laurie dies, furthering the rift between the two. Years later, Manning develops the same type of tumor and turns to Jerome for help. The psychologist hypnotizes his once-close friend, telling him that, as long as he is in a hypnotic trance (with the magic wake-up word being "Laurie! "), he cannot die. When Dr. Manning leaves Lester's office, he's run over by a car and pronounced dead. Hours later, his corpse revives, stunning the hospital doctors. When Dr. Lester is summoned, he explains the phenomenon but the doctors scoff and send him away. Months later, they're still skeptical but call the man back. Lester accidentally utters the word "Laurie" and Manning snaps out of his trance, decaying after months of death. 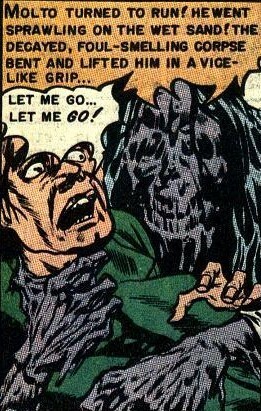 An obvious "nod" to Poe's "The Facts in the Case of M. Valdemar," "The Living Death!" is a sick but funny semi-revenge tale that brings a big smile to my face every time I read it. The only problem I have with Ghastly's work here is the same problem I have with most of his work: his characters all look alike. 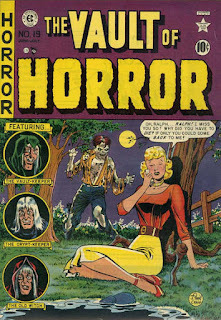 It's tough to discern the difference, at times, between Lester and Arnold (and Graham sure didn't provide the cheesecake that Kamen and Craig were able to whip up at a moment's notice) but then, Ghastly didn't become the most famous horror comic artist because of his human characters, did he? Duncan Reynolds falls asleep while reading a book of horror stories and, before he knows it, he's a ghoul eating corpses in a graveyard. No, wait, it's all just a dream. No, hang on, the corpse that tumbles out of his refrigerator claims otherwise. "Midnight Snack!" must have been the easiest job Johnny Craig ever worked on as the entire story is made up of nothing but panels of Duncan, usually in his blue suit. From the opening, where Reynolds walks into a restaurant late at night only to become ill from the smells emanating from the kitchen, I thought this might be an early version of the classic, "Midnight Mess!" but, no, Al takes us down another path altogether. Strange that, other than a few subtle references, we're spared the sight and sound of Duncan Reynolds chowing on his supper. 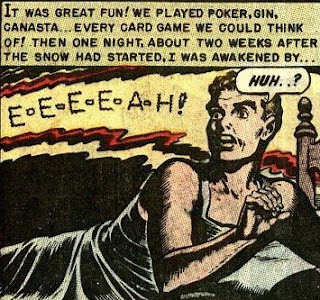 Jose: While “Bats in My Belfry” may not represent the gold standard in storytelling for Entertaining Comics as my cohort Peter asserts, it has to be one of the most fun and inventive tales that we have yet to come across. How can you not love that gonzo premise, reminiscent of the Brothers Grimm tale “The Three Army Surgeons” in its coda of men taking on the bestial aspects of their inadvertent organ donors? It’s the little touches that I especially appreciate, like the shady doctor operating from a grimy taxidermist's shop, and it all ends with the wicked touch of black humor that Jack Davis did so well. Though both “The Living Death” and “Scared to Death” are grounded in more “traditional” concepts, I prefer the latter for avoiding the inertia of the former by running its two story lines simultaneously; learning of Ralph’s long streak of manipulation in the past while he attempts to put the final touch on his master plan in the present keeps the reader glued to this nasty fellow who soon finds out that his lies have a surprising amount of truth to them. “Midnight Snack” is a disappointing puff piece for Johnny Craig. Having steadily read the stories which Craig both wrote and drew, Feldstein’s running-on-empty script here can’t help but look even worse than it normally would. Jack: I got a big kick out of "Bats in My Belfry!" My favorite line: "When I awoke, I was hanging upside down in the closet!" Now, who among us hasn't had that happen? It's bittersweet to read this fun story a day after hearing about the death of the great Jack Davis at age 91. Ghastly's "The Living Death!" is a very well-drawn story that shows that, when Feldstein swiped, he swiped from the best. I do like the way he added the element of revenge to the original story, and the splash panel includes a cool little creature on the right of the Old Witch--a head perched on a hand, with the wrist as its neck. Johnny Craig can do no wrong in my book, and I thought "Midnight Snack!" was a winner, despite being predictable. Sometimes it's just satisfying to have a story turn out the way you think it will. Speaking of that, "Scared to Death!" follows a familiar pattern but features classic Wally Wood art and a prolonged look at a decaying corpse that outdoes most of what we've seen from Ingels so far. Of course, that will soon change! 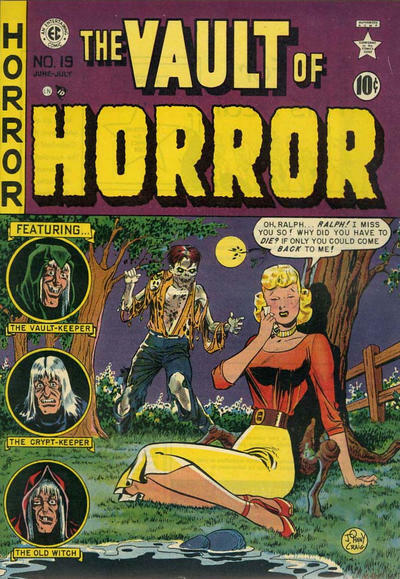 John: I enjoyed "Midnight Snack" for its silliness, but my favorite in this issue was "Scared to Death!," which not only features a great shambling corpse (go Wally! ), but the entire story breaks from the monotonous panel layout you can all but count on seeing in an EC comic. While the story might not have been as fresh, it was a welcome change of pace as I dragged my eyeballs across the page. The conclusion of "The Living Death!" Why is Harry Marks hiding in "The Sewer!" trying to keep his head above the rising water? He thinks back to a party, where he was dancing with Irene Golden. Her husband was a matinee idol who had many young female admirers. Irene confesses her unhappiness to Harry, admitting that she loves him and wishes she could leave John. Harry understands that John would never divorce her, so he leads the drunken husband to the bathroom and socks him in the jaw. 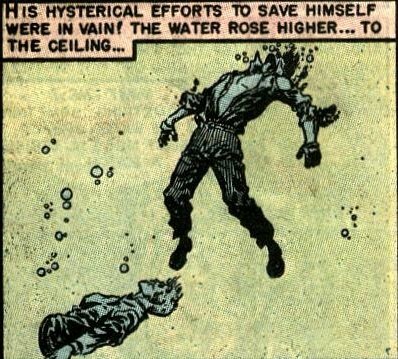 John bounces off of the tile wall and lands in a tub of water, where he drowns. 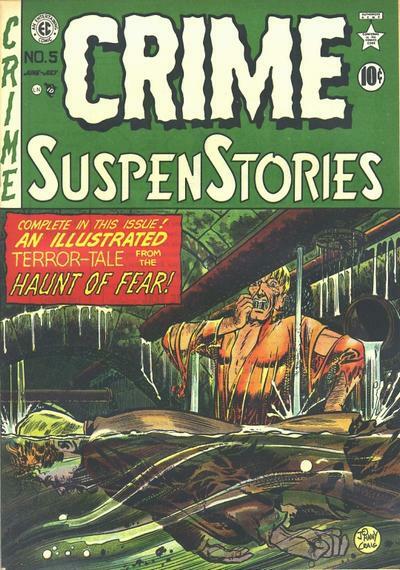 Harry gets ready to dump the body in a sewer during a rainstorm and Irene suddenly snaps, losing her mind when she realizes what has occurred and running off. Harry disposes of the corpse. The next day, he reads in the paper that Irene went to the police but is insane. Harry goes to the police looking for Irene and spends hours being questioned, but the police will not let him see the widow. He drives through the rain and returns home to find detectives waiting for him. Harry makes a run for it and hides in the sewer, where the water is rising fast due to the torrential rainstorm. He is disgusted when he discovers John's bloated corpse floating near him and, when the corpse blocks the drainage pipe, Harry is drowned. Up above, the police wonder what happened to Harry and why he ran, since they were just trying to warn him that Irene was threatening to kill him. To me, this is a four-star story all the way, and Craig's art and storytelling owe a big debt to Will Eisner. From the splash panel to the small panel where we see a gloved hand on a ladder rung, The Spirit influences this excellent noir tale. "Mr. Biddy . . . Killer!" 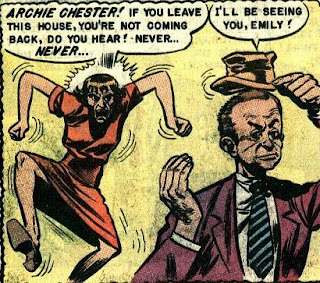 Archie Chester sits in a cell on Death Row, having been convicted of the murder of his wife. Yet he insists that the guilty party was "Mr. Biddy . . . Killer!" He tells the Assistant D.A. the story of how they met and what happened and, when Archie tells the attorney that Mr. Biddy is sitting in an empty chair in his cell, the A.D.A. decides he belongs in the nuthouse, not prison. Jack Davis's art in these early stories is inconsistent, and this story goes back and forth between pretty good and not so good drawings. A vacation at a hunting cabin turns dark for five fraternity brothers when one of them is found murdered. The crime remains unsolved for a year until the murdered man's wealthy father holds a dinner party for the four suspects. He announces that he knows the identity of the guilty one and poisoned his drink. He holds out a glass of antidote, certain that the killer will reveal himself by drinking it. Yet when the killer does gulp down the brew, it turns out it was the poison and not the antidote. "The Gullible One" is a straightforward adaptation of a Cornell Woolrich suspense tale called "After-Dinner Story" (Black Mask, January 1938); Feldstein and Kamen don't improve on the original. Peter: "Partially Dissolved" is about as standard a "corpse rises for revenge" tale can get. Change Molto's profession to movie star, auto mechanic, hairdresser (etc. ), and we've seen this countless times already. I thought "Mr. Biddy . . ." was moving into uncharted territory (the bargain with the devil tale) for a bit before it morphed into something a lot more original (well, it was probably original for its time). "The Gullible One" features a fabulous double twist and Kamen is the perfect artist for something that is essentially a stage play; not a lot of heavy lifting for Jack. in this issue's Kamen story! Jose: What’s this, Peter? No reactions to Johnny Craig’s “The Sewer”? For shame! To this reader’s eyes, Craig’s lead story is a bona fide classic, highlighting all the qualities of his craft that we love, like the tiny quirks of personality that bring so much more depth to his characters; one of my favorite moments was when Irene asked Harry not to “hurt” her husband’s corpse before the full reality of the ugly deed she consented to came rushing at her with full force. Thematically speaking, it’s a particularly strong piece. Notice how all of our main players are “submerged” throughout the story: in alcohol, in the bathtub, in the unceasing rain, and finally in the scummy depths of the sewage system where Harry drowns like the conniving rat he is. “Mr. Biddy . 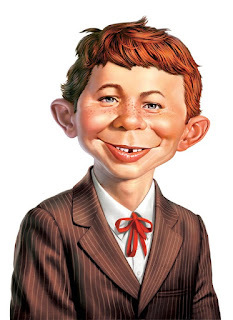 . . Killer” might seem old hat to us, but apparently that twist ending was still up to snuff six years later when Robert Bloch published “The Real Bad Friend” in Mike Shayne Mystery Magazine, a story that bears a mighty strong resemblance to Feldstein’s script. (An ironic turn of fate considering that “Daddy Lost His Head” from this month’s issue of Vault of Horror lifts liberally from Bloch’s classic “Sweets to the Sweet.” The wheel of inspiration is always a-turnin’!) “The Gullible One” is a pleasant drawing room thriller that features cozy art by Jack Kamen that goes down like a glass of good port . . . or poison, depending on your predilections. Peter’s right on the money with “Partially Dissolved.” For all that build-up with dissolving chains and magic and stage illusions, having the avenging corpse literally walk up to its murderer when the criminal visits the scene of the crime and simply drag him to his death is an awfully anti-climactic way to put a cap on things. John: I'll take a Ghastly corpse any day of the week, but I have to admit, "Partially Dissolved" didn't knock my socks off. 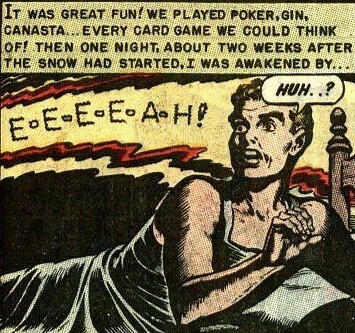 Particularly when it seemed like the story might go somewhere much more interesting with the magician premise. Definitely a missed opportunity to show a body cut in half... 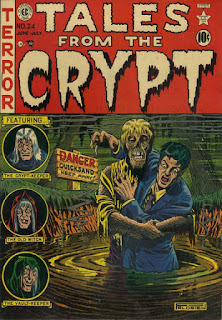 I thought "The Sewer" was the highlight of the issue, nicely complemented by Johnny Craig's fine art. On the shore of a nocturnal lake “just outside a small Midwestern town,” Lillian waits underneath the old gnarled oak for the arrival of her beloved Roger. It’s been five years since last she saw him; this is the third such “Reunion” the lovers have had since the time they fell for each other at a late night dance. Lillian, young vivacious Lillian, was too full of life for Waldo Ansley, the man fourteen years her senior whom she married as a starry-eyed nineteen-year-old girl. Meeting Roger at the dance was to become both blessing and curse for their romance in the years to come. For Lillian’s compassion cuts both ways: she’d love nothing more than to live with Roger for the rest of her life, but Waldo’s diagnosis of permanent paralysis engenders her sympathy and a sense of marital responsibility that she must see to its end. But the end is a long time coming: over a decade passes before Waldo goes gently into that good night. Fate has a nasty surprise in store for Lillian, though. After she waits an appropriate amount of time following her husband’s death to resume her romantic pursuits, she receives news that Roger was killed in a train wreck two years prior, his body as mangled as Lillian’s hopes. Weeping by the side of the lake where their previous rendezvous were staged, Lillian hears a familiar voice whisper her name. It’s Roger, but his corpse is in horrible shape, the grave’s rot and wear of the twelve-mile trek from the cemetery clearly showing. Lillian is at first horrified before something . . . inside her head . . . snaps. Come early morning’s light, there are two bodies revealed underneath that old, gnarled oak. A woman, freshly dead, and a man, dead for some time, but both of them are smiling. That tame and oh-so-slightly tongue in cheek cover rendition of “Reunion” by Johnny Craig gets nowhere near the real story’s dark, beating heart. (For the record, I doubt Craig or anyone else was “to blame” for this. It’s my belief the artist was simply given the story’s logline sans emotional tenor and assigned to take it from there.) Feldstein shows some very surprising and much-welcomed developments with this script. It has a few syrupy touches to be sure, but in reading “Reunion” we can see Feldstein attempting to revolutionize a narrative formula that had already become locked in place, that of the pair of lovers conspiring to unhitch the third wheel of the romantic triangle. Outside of their extramarital activities, neither Roger nor Lillian come across as wicked or conniving people. It’s a genuine shock when the ominous revelation that “Lillian realized there was only one thing to do . . .” is immediately followed by Lillian explaining to Roger that, as Waldo’s wife and sole caregiver, she must stand by his side at all costs. Quite the sea change from all the shrews and vamps that have filled these pages thus far! This development, along with Roger’s acquiescence to Lillian’s wishes and (we assume) his faithfulness to her during his time away, makes the later developments of the story all the more crushing. We’ve grown to like these two kids, and every time the merciless universe sees fit to put the screws in them we can’t help but hurt for them. The disturbing finale forces us into a corner: are we meant to be happy for the lovers reunited at last, or horrified that they were rejoined under such gruesome circumstances? That, dear reader, is up to you. As can be expected, the stories preceding “Reunion” in this issue can’t quite hold a candle to its putrescent magnificence. Traditional payback, just like Mom used to make, is the order of the day in “The Jellyfish” and “Daddy Lost His Head.” Jack Davis demonstrates a steady increase in prowess in the former tale, though his best work seems to be confined to the scenes with brothers Charles and Howard Norton. When “spineless” head pharmacist Howard refuses to dilute the insulin formula in order to reap in higher profits, business manager Charles makes the decision for him, leading to a wave of deaths that the weaselly Charles pins on Howard, leading to the latter’s incarceration. Ten years later, Charles gets to try out Howard’s formula for bone-disintegration when he swallows a pill that turns him into a pile of gooey flesh, marking this one as B-level potboiler that gives you what you came to see. Jack Kamen returns from “Horror in the Schoolroom” for an after school special on abusive parents. Little Kathy is despised by step-dad Martin because she looks a bit too much like Mommy’s first husband, and he never passes up on the chance to strike the girl or overburden her with chores. Thankfully Kathy has a protector in the form of next-door-neighbor and bona fide witch Mrs. Thaumaturge looking out for her. (Rusty on her Greek lessons, Kathy misses the fact that the old lady’s namesake stands for “magician.”) The crone gifts Kathy with a caramel candy doll in the likeness of her stepfather, and when she nibbles on the little man’s hand in a fit of hunger old Martin just so happens to “accidentally” buzz the appendage off with a work saw. Biting off the candy man’s head to demonstrate its powerlessness to Martin provides the expected results. Peter: The obvious winner here (by a long margin) is "Reunion!," a delightfully sick love story and a rarity in the EC pantheon, a story sans villains. Ghastly's finale, where the lovers are finally together after a decade (albeit in a strange form), pushes the boundaries of even pre-code horror. Is it safe to assume that the two lovers seal their relationship with more than a kiss? And how did Lillian succumb? I've my suspicions! An all-around classic. 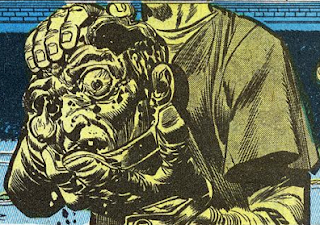 The shocking final panel of "Daddy Lost His Head" might have been a bit more effective if the "twist" hadn't been telecast two panels prior. The best EC villains are those with a touch of humanity (I guess we can identify with the cads who are closest to ourselves). Abner Scanlon, the protagonist of "Southern Hospitality," is one of those rotten to the core, smile-while-watching-someone-die nasties that I just can't warm up to. Once a reader has been shown the blackest of hearts, there's not much that character can do to shock us, is there? The story hums along and it's not without its high points (the humor is spot on, as when Abner must feign patience while the relatives drone on endlessly about General Jackson), but "Southern" goes down as a near-miss for me. "The Jellyfish" is another of Al's scripts to borrow from modern literature, in this case Ray Bradbury's "The Skeleton" (from Weird Tales, Sept. 1945). About a year later, Bradbury would finally pen a note to Bill Gaines, telling him he loved the "adaptations," but he'd love them more if he got paid for them. Soon afterwards, the two struck up a deal and we're the better for it. But that's another story. Jack: "Reunion" finally delivers the goods, with full-on views of the rotting corpse spread over several panels. Contrast this with "Daddy Lost His Head!" where we do not get to see a panel with the title event. Jack Davis also comes through in "The Jellyfish!" though it's a fairly run of the mill story until the devastating last half-page. I liked "Southern Hospitality!" but not as much as I liked "The Sewer!" It's funny how the elders go on and on about their ancestor and the main character sure finds a way to do a lot of partying on thirty dollars. The old folks pass away much too quickly and the ending is a bit of a letdown, but I'm enjoying Johnny Craig's work so much that I may look for a book about his career. John: "The Jellyfish" earns its keep in the last page of the story, but let's face it, "Reunion" knocks it out of the park! Best story this month across all three titles. I thought this one was great, and I think it's the first time we see a corpse getting his love reciprocated! Nice job, Ghastly! 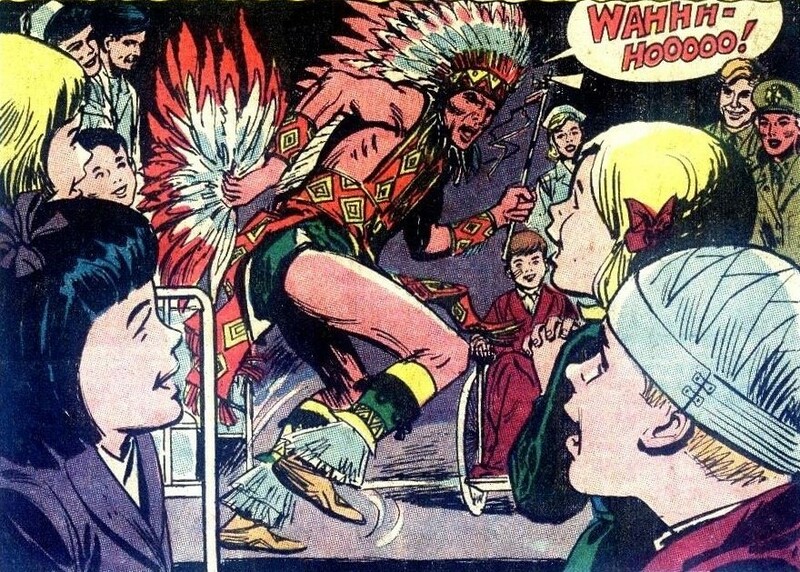 Has Johnny Cloud finally gone off the deep end? 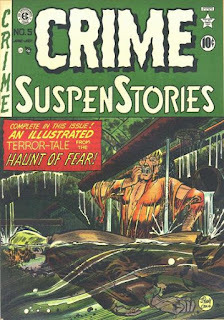 "The Sewer" remains one of my all-time favorite Craig stories. Craig was very ahead of his time, much like Will Eisner, in that he understood the versatility of visual storytelling. His adaptation of Bradbury's "The Fruit at the Bottom of the Bowl" ("Touch and Go") is a masterpiece and "The Sewer," at least from a visual standpoint, isn't far behind. 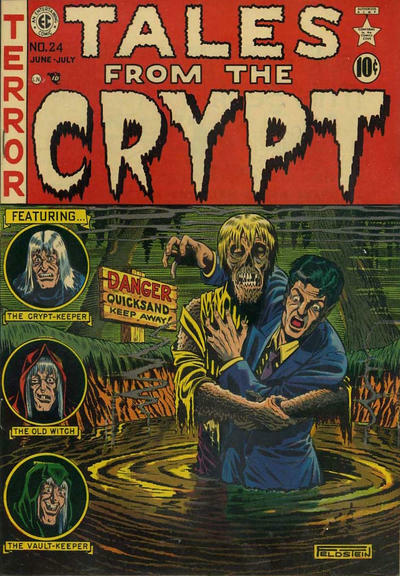 Feldstein's cover for Crypt #24 is perhaps his greatest horror cover and certainly one of the more iconic EC covers. Thanks for these articles, guys. You have me cracking open my long boxes to find my old Russ Cochran reprints from the '90s. I haven't visited this material in a long time. Hey Jordan! Glad to hear you've been enjoying the series. Always great to have another EC fan with a critical eye along for the ride. Looking forward to hearing from you on our future essays. For anyone who happens to peek into this comments section, let it be said that Jordan is himself the author of a mighty fine and comprehensive blog, The Twilight Zone Vortex. Give him a visit and tell him to keep up the great work! Thanks for that! I appreciate it. I passed one of the earlier EC posts along to the EC Fan-Addict group on FB and they responded well. If you guys aren't in touch with that group you should consider reaching out. Those guys collectively know more about EC than anyone else on the planet and they are always sharing drool-worthy collectibles and rare ephemera.